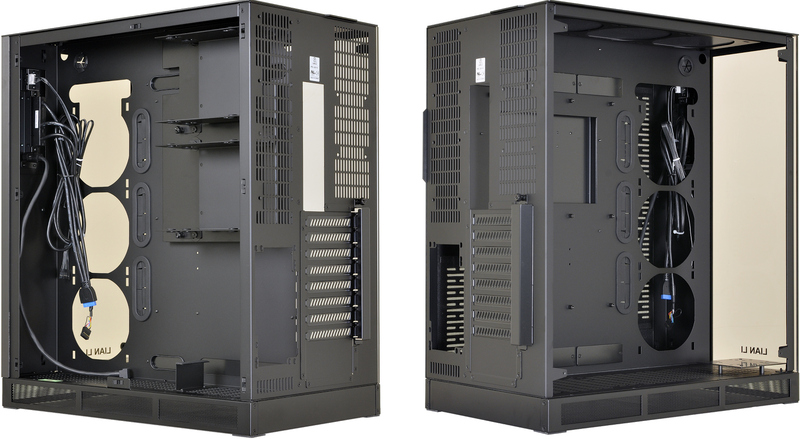 Lian Li has introduced its new chassis for advanced desktops, the PC-O11WGX. The company's latest case has two chambers for more efficient cooling, is compatible with motherboards in the E-ATX form-factor, can fit in nine storage devices in drive form-factor, three 360-mm radiators and has a USB 3.1 Type-C header on its front panel. Stylistically, the case comes with a front panel featuring ASUS ROG stylings, which means incorporating Mayan patterns. Being aimed at modders and overclockers, the Lian Li PC-O11WGX is everything but affordable. 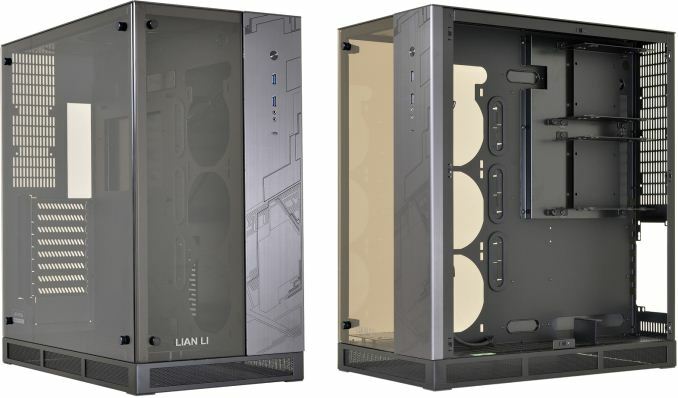 The Lian Li PC-O11 WGX chassis follows the latest trends in PC building and is designed to be suitable for highly-modded systems while also being very efficient in terms of cooling and compatibility. On the outside, the case has two panels made of tempered glass, exposing the key components of the computer. Inside, like many other contemporary PC cases, the PC-O11WGX uses a two-chamber design: one of the compartments housing the motherboard, graphics card, memory, and cooling, another accommodating the power supply, cables, along with nine HDDs and/or SSDs. The new case from Lian Li can fit in a motherboard in ATX, E-ATX, Mini-ITX and Micro-ATX form-factors with up to eight add-in cards. Moreover, for those who like to see/expose their graphics cards, Lian Li supplies a special riser cable to install the graphics card vertically. The maximum length of the graphics card is 430 mm, so, not only single-GPU, but dual-GPU boards are supported with plenty of space left. Meanwhile, the maximum height of the CPU cooling system is 150 mm, so not all mega-coolers can fit in (e.g., Thermalright’s Archon IB-E X2 cannot). Speaking of cooling, Lian Li built the PC-O11 WGX primarily with liquid cooling in mind: the chassis has space for three 360-mm radiators for closed-loop or custom liquid coolers, enabling its owner to build a gaming system with a HEDT CPU, a couple of graphics cards, and then cool each of those components using its own LCS (or build one LCS with three radiators if necessary). To provide enough power for everything, the case can accommodate a PSU that is up to 430 mm long. Since we are talking about a high-end chassis, the PSU and HDD/SSD mounts are equipped with rubber vibration dampers, whereas the top and bottom panels are equipped with mesh dust filters (unclear whether they are removable though). Internal 4 × 3.5" and 4 × 2.5"
Lian Li says that ASUS has certified the case, guaranteeing that all the ROG-family components will fit in and will work flawlessly. 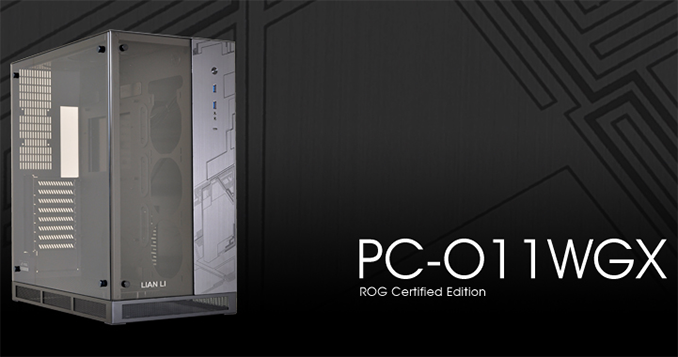 This is not the first ROG-certified chassis from Lian Li - and arguably it's more of a co-branding exercise than any kind of stringent technical qualification - but the additional styling and verification from ASUS engineers never hurts. The Lian Li PC-O11WGX computer chassis will be available in North America in mid-May for $319. The price of the case is rather high, but since we are dealing with a top-of-the-range product aimed at modders and performance enthusiasts, it is not surprising. That wasn't the point. Would you rather have to buy a "ZD3601BAM88F4_40/36_Y" or a "Ryzen 7 1800X"? 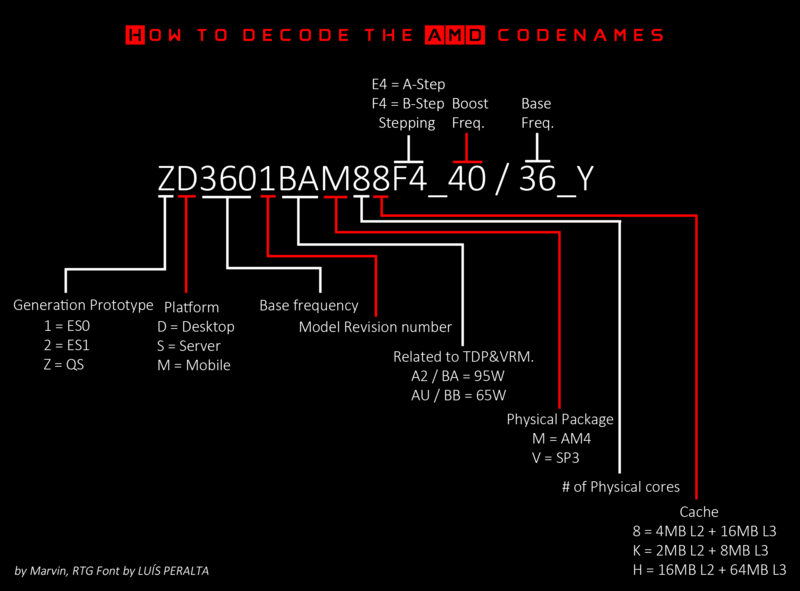 In case you are wondering every letter and number in that SKU has a very specific meaning. It's not so much a window as it is the material of the structure. A traditional case window, by definition, fits inside the chassis as a framed window. These are glass panels. It's very modern, but as with most Lian-Li designs, is a little stale. I'm also just biased toward Silverstone because of my history with them. No denying Lian-Li makes exceptional cases though. Anyone have one of these new tempered glass cases? Style over substance. Years ago I was dumb enough to spend $200 on one of their cases. Well built but not very functional. Things have moved on. There are plenty of cases out there, well made and with a lot more thought into their design. Plus more reasonable prices.